Here are some virtual reality example data sets that can be viewed with ChimeraX using virtual reality headsets. ChimeraX works with HTC Vive headsets. It will also work with Oculus Rift headsets, but requires using SteamVR since ChimeraX acceses the headset through the Steam virtual reality toolkit. Install ChimeraX for Windows 10. At our lab we use a high performance Nvidia GTX 1080 graphics card with HTC Vive and Oculus Rift headsets. Be careful -- using less powerful graphics may cause the demonstrations to stutter which can cause motion sickness. Download the ribosome_vr.cxc ChimeraX command file and open it using ChimeraX menu entry File / Open.... This will fetch a molecular structure (4v7s from the Protein DataBank) and X-ray crystallography data from and Electron Density Server public databases. This can take a minute or more (140 Mbytes of data), but the data will be saved in your Downloads directory, so this only has to be done once. This scene immerses you in an E. coli bacterium ribosome, the giant molecular machine that translates DNA and RNA into proteins in all living things. 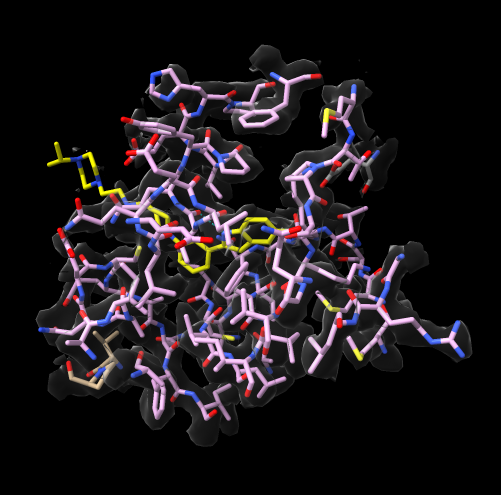 This scene has an antibiotic telithromycin, consisting of about 40 atoms shown in purple at the center of the ribosome. 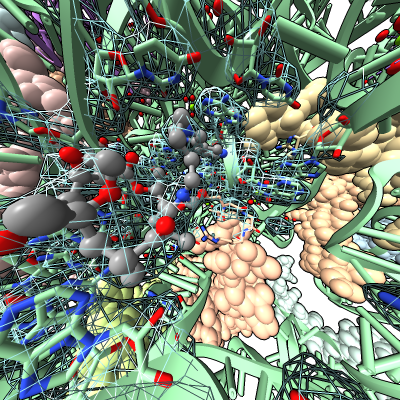 In the scene, ribbons show RNA, spheres show protein components of the ribosome, and the transparent surface near the ligand shows the experimental X-ray data used to determine this structure. More details. 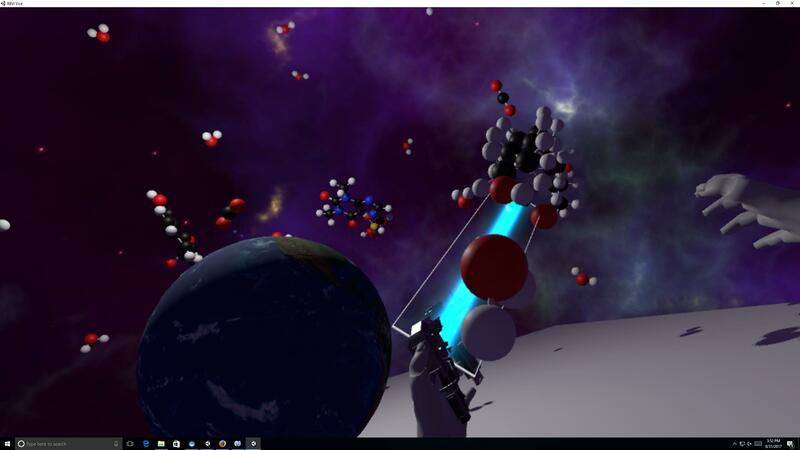 This molecular VR application allows holding flexible small molecules like water, carbon dioxide, aspirin, caffeine, saturated fat, sulfuric acid, breaking them, reassembling them. It does not use ChimeraX, but instead is a standalone application (built with Unity). Extract it from the zip archive molzoo8.zip and run the application and use the hand controllers, index finger to grab, tractor beam or shoot molecules, and thumb pad to switch modes. Source code and possibly newer releases are available at Github Molecular_Playground.